What is the medium to be controlled. Is it a liquid, gas, or slurry? Is it corrosive, abrasive, explosive or clean single-phase medium? What is the upstream or inlet pressure. Don’t guess – use a gauge. What is the downstream pressure when valve is closed, and when flowing? Are the Vapor pressure, viscosity or specific gravity and critical properties known? What are the inlet and outlet pipe size(s) [ May be different ] and schedule? Normal, Minimal, and Startup conditions for flow, pressures and temperatures? What impact will even a small seat leakage create when shut off? Is the installation in an occupied area. Noise or other hazardous considerations? What is the “fail safe” orientation? In place, closed or open? If in a fail safe orientation, is a manual readjustment to be expected? What is the ANSI Pressure Class of the pipe flanges and valves in the loop? What has been the operational history in an existing application? What material is the existing piping made of. Is it considered compatible? Is there an existing valve in place and a face-to-face dimension to match? Where will the valve be located – elevation – within a piping nightmare? What maintenance – routine or preventative is normal and expected? What are preferences for Control Valve Actuation – pneumatic or electric? WHY? Is the customer going to actuate it himself and buy a “bare stem” valve? Is the stem boss compatible with his actuator stem. Double “D” or square? Is the calculated flow velocity below limits of 100 – 125 fps for saturated steam? Is the calculated flow velocity below limits of 5 fps for liquids? Is the calculated flow velocity below limits of 250 – 400 fps for gases? Could moving vehicles damage the valve, in a specific installed location. Might seismic forces or fires present a danger to workers. Might workers use the valve as a stepladder when conditions dictate? Is the application a “continuously modulating” or an on / off practice? Might the process be shutdown for nights or weekends? What might result when started back up after an extended shutdown? Use your imagination, anticipate the worst, and ask more questions – more, in this case, is always better. What range air set is available for actuator or positioner? Could it allow a higher than safe pressure? Where will the user store documentation for IO&M purposes? Is routine maintenance allowed or is an annual shutdown more typical? Could moving vehicles damage the valve, in a specific installed location? Might seismic forces or fires present a danger to workers? What codes may be in effect? Body pressure Code, Leakage Criteria? Flowing media to be controlled. Steam, Liquid or Gas? Pressures upstream and downstream, therefore the differential. Two way – modulating, or on/off. Three way diverting or mixing? Is the material abrasive, explosive, or clean? Hot or Cold water chemically treated? What are inlet and outlet pipe sizes and schedules? Maximum, Normal and Startup conditions? Control signal – PID compatibility? Checklist courtesy of Warren Controls. 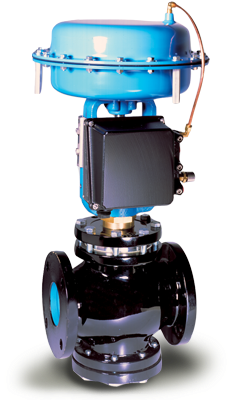 Please consult with a application expert before selecting or installing a control valve.